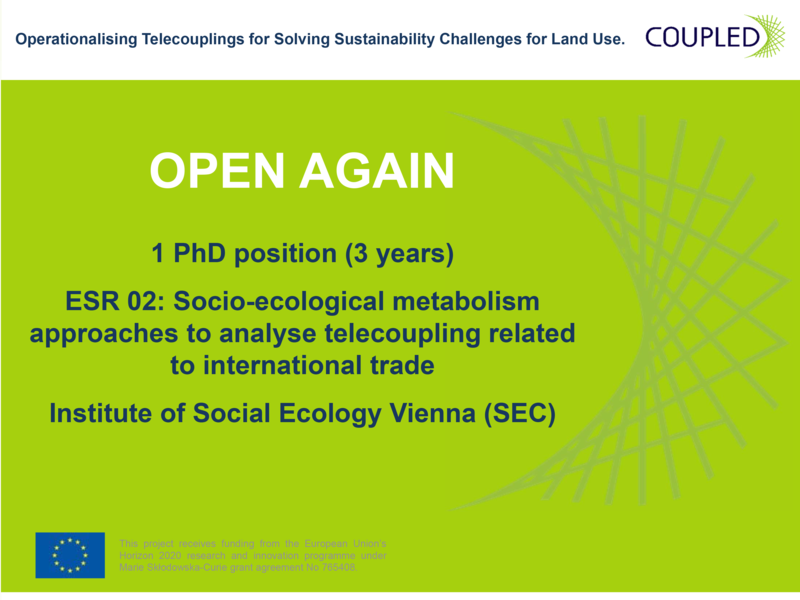 The Institute of Social Ecology Vienna (SEC) at Alpen-Adria University Klagenfurt (UNI-KLU) seeks highly qualified and motivated candidates for 1 PhD position (3 years) in Socio-ecological metabolism approaches to analyse telecoupling related to international trade, starting from 01 September 2018 or earlier. We seek a candidate with an above-average MSc (or equivalent degree) in interdisciplinary environmental sciences such as Ecological Economics, Social Ecology, Human Ecology, Geography or or related fields. We expect strong interest in land use and land system science and sustainability problems and interdisciplinary work. Required skills include a sound background in quantitative methods, handling of large databases, proficiency in database management software, programming ability and strong analytic skills. GIS expertise is welcome. Do you consider applying? Please go to http://coupled-itn.eu/recruitment/. Download and carefully read the Guide for Applicants for all specific information on the application and selection procedure. Closing date 16th of March, 2018.